Chemo Kitty Hates Her Food. Gimme That One! Cancer is a wasting disease. Weight loss and lack of appetite commonly accompany cancer. Chemotherapy doesn’t help, because as it destroys cancer cells, it also destroys healthy cells, and as cells in the mouth and digestive tract die, it changes a person’s sense of taste and desire to eat. Martini has had a tough time gaining and maintaining her weight through all this. Her issues are even more complicated by her food allergy, because we can’t just offer her any food, and we can’t offer her table scraps. Before her cancer diagnosis, Martini had been eating a low allergen prescription food since her protein allergy was diagnosed in fall 2009. She happily ate Hill’s Prescription Diet Z/D Ultra Low-Allergen food and aggressively bullied her brothers away from first dibs at the food bowl. Cancer changed all that. She just wasn’t that hungry. We started giving her the Z/D canned food, and it seemed all was right again. She couldn’t get enough! In fact, when we first started feeding it, she ate too much and made herself sick. Yuck. But the appetite was short-lived. Even with the daily prednisone to stimulate her appetite and the daily anti-nausea medicine, she lost interest in the canned Z/D. So back to the vet we went to find something else that she could eat… that she might eat. The vet sent me home with a sample to try. She loved it! It was like turkey on Thanksgiving! The first couple of days, whenever her bowl was empty, she begged for more. She wanted nothing to do with that old, crappy food. But again, she ate too much and made herself sick. So now, she is being closely rationed on her new Royal Canin Hypoallergenic Hydrolyzed Protein (HP). Doesn’t that sound yummy – hydrolyzed protein!? I don’t even know what that is, but at least Tini seems to think it’s amazing! She can have unlimited Z/D food, but you would think when looking at her turned up nose that I was offering her Spam. On second thought, she would probably love Spam. It would be like offering her Brussels sprouts. Well, if hydrolyzed protein gets her to eat, that’s fine by me. Let’s hope she likes this one for awhile. Anyone who knows me knows that I work to live – not the other way around. And a big part of my sanity is based on always having a trip in the works. Jon and I haven’t been anywhere since September, so at this point my sanity is seriously in question! Fortunately, we are in the planning phases for a California road trip! Why California? And why a road trip? Well, originally, I wanted our next vacation to be to Virginia. I love the history of the South East, and of course the Civil War historical sites! Jon had such a great time on our Grand Tour to Georgia, North Carolina and South Carolina last summer that he had readily agreed to the trip. We were researching places to visit and airfares, but something kept nagging at my heart. She’s about 7 pounds… furry with a shaved spot on her belly, and that little something called lymphoma. I had talked to my mom and she was willing and able to cat-sit and do Tini’s meds for the 10 days we would be gone. But I kept feeling anxious – what if something happened to Tini while I was away? What if she went downhill? So Jon and I talked about doing a California road trip instead. That way, if Tini’s condition worsens, I can be home in a day, and we will only potentially be out a night’s hotel stay. And we won’t have to worry about trying to change flights in a frantic attempt to get home. Instead, we would just have to drive. And I know that you can make it from Bakersfield in 25 hours, with a 5th wheel trailer in tow. I know that because that where my parents were when my friend called them from the hospital to tell them I was going into surgery to have my appendix removed! And we aren’t going as far as Bakersfield. We are planning on doing a day at the wineries of the Anderson Valley. I’ve been perusing the web, Chowhound and some blogs, to try to get recommendations on Anderson Valley wineries. But I thought I would put it out there to my wine peeps. I’ve narrowed down the list some, and I think that these are the ones we might want to visit. But in a day, we can only visit four or five, so which are your suggestions? Anybody have any experience with the Anderson Valley wineries on the list below, or ones that we should consider that I’ve missed? Thanks! Most wine junkies drinkers have their stories of that little tasting room that they happened upon, or visited on a whim, and were delighted by the result. Here’s one of mine. Maison Bleue is a winery that Jon and I happened upon during a trip to the Yakima Valley during Red Wine and Chocolate weekend in 2011. I blogged about that day here. We had the opportunity to meet the winemaker, Jon Martinez, and his story is pretty interesting! You see, he used to be a dentist… No, seriously! Jon (the winemaker, not my husband) originally owned a dental practice in Missouri, but decided he wasn’t satisfied with that, so he began helping out a winemaker friend and taking courses in Enology. He moved out to Washington to start his winery, which focuses on the Rhone varietals (and he throws in some Chardonnay). When we were tasting the Maison Bleue lineup, we really enjoyed chatting with Jon and hearing his story. For a man who has found success relatively quickly in the wine industry, he is humble and friendly, and his passion for his product shines through. I hear that he is opening a new tasting room this spring in Walla Walla, and I hope one day to be able to check that one out too! 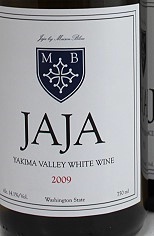 Tonight I’m sipping the 2009 JaJa White, a blend of 67% Roussanne, 28% Chardonnay and 5% Marsanne. 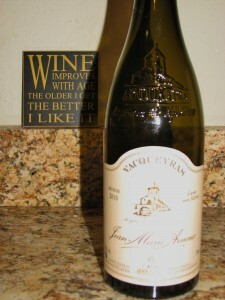 The wine is a very pale yellow, and it has a faint floral nose. It tastes of crisp citrus with pear and floral tastes, with a light minerality. There is a light oak on the finish, which gives it a wonderful complexity without overdoing the oak. It is a fantastic wine! Maison Bleue only produces about 2200 cases overall, but for a small winery, he is increasing his distribution pretty quickly. I am frequently surprised at how often I see their wines in various wine shops I have visited, and he has distribution in several other states too! So if you see any of his wines, I hope you will check them out! 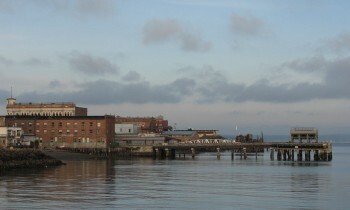 On Saturday, January 19, Jon and I decided to get out of town and take a little day trip over to Port Townsend. The weather was supposed to be sunny and dry, and since we had a rare day off together, we wanted to do something special. We got up early (early for a Saturday anyway) and headed down to Coupeville to walk onto the ferry. When we got on the ferry, it was still very foggy and overcast, but we had high hopes that the fog would burn off and clear up once we got there. The ferry ride is about 35 minutes, and it is a very smooth trip. We were on the Kennewick, which seems to be one of the newer ferries in the Washington State Ferry System. 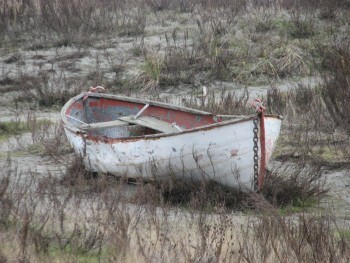 Some of the ships are up to 65 years old! I got some photos from the deck, but unfortunately with the fog and dark, overcast morning, combined with the zoom, they didn’t turn out as well as I had hoped. Beyond coming up with the plan to go to Port Townsend, Jon didn’t really have any specific ideas about what he wanted to do for the day. So the planner in me took over. 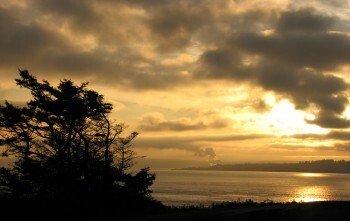 I wanted to visit Fort Worden since I haven’t been there in several years. Once we got off the ferry, we trekked the little more than two miles over the hill and out to the fort. Fort Worden is a fort in Port Townsend that was established in 1902 (construction began in 1897). 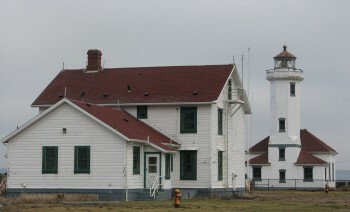 It is built along Admiralty Inlet, and is one of three forts that were built to protect the entrance to Puget Sound, which leads to Seattle and Tacoma. 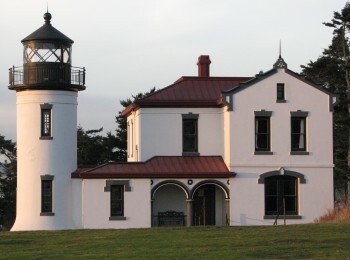 The other two forts are Fort Casey (in Coupeville, Washington) and Fort Flagler (Nordland, Washington). 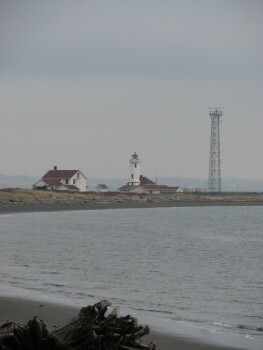 Fort Worden is named for U.S. Navy Rear Admiral John Lorimer Worden, who commanded the U.S.S. Monitor during the Civil War. Fortunately for those of us in the Pacific Northwest, we were never attacked, and none of the three forts ever fired a hostile shot. 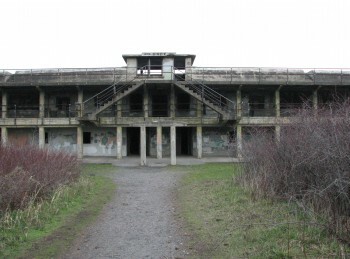 The guns were removed and shipped to Europe during World War I.
Fort Worden was decommissioned by the Federal Government in 1953, was purchased by the State of Washington, and became a juvenile detention facility for a period of time before it was transferred to the State Parks Department in 1971. It opened as a State Park in 1973. Now, kids and adults who want to re-live their youth can run around in the concrete fort, spook themselves in the tunnels, and explore the batteries. Another cool feature of Fort Worden is the Officer’s Homes and Parade Ground. There are nine Officer’s Homes, ranging in size from a 4 unit apartment home, to duplexes with three to six bedrooms in each unit. One of the homes is an Officer’s Home Museum, and is open seasonally. Unfortunately, it isn’t open in the winter, so we didn’t get the opportunity to tour it. It has been a long time, but when I was a child we used to rent out one of these homes each year and stay there with family friends. We got to explore the fort during the day, walk to town to do some poking around in the souvenir shops, and then play games and hide and seek in the evenings. Staying there each year is one of my favorite childhood memories. Maybe one day I’ll stay there again! 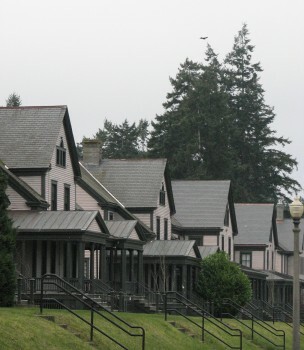 The Row of Officer’s Houses at Fort Worden – An Officer and a Gentleman Was Filmed Here! Once we were done poking around the fort, Jon and I walked back to town. 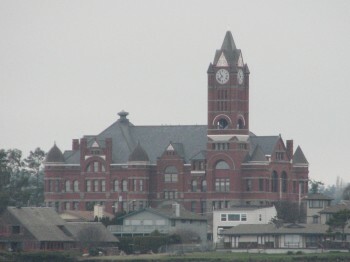 On the main street, Water Street, lives the Jefferson County Historical Society Museum, housed in the Old City Hall. We had heard good things about the museum, so we decided to stop in and take a look around. The volunteer docent was very friendly, and told me that I could take photos, even though the sign said no. Ssshhh! Don’t tell! The museum is an eclectic mix of artifacts that the historical society has acquired over the years. There is an exhibit detailing the history of settlement in the area, from the Native Americans, the French and Russians, the British, and then finally, American settlement in the 1850s to present. It details the attempt by Port Townsend to become the State Capitol (that didn’t happen), and the history of Chinese and Japanese laborers in the area. The museum has an antique horse drawn hearse and several other interesting things. In the basement, you can tour the original jail of City Hall, built in 1892. 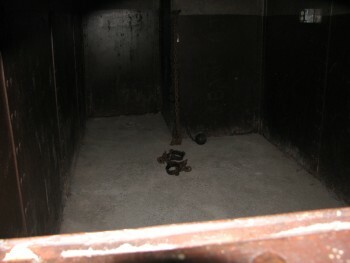 One thing is for certain – I wouldn’t want to be locked up in that solitary confinement cell! Also in the basement there is a fascinating exhibit on the history of prostitution in Port Townsend, with some photos of madames and the women of sin who worked in the area. You can visit and see everything in less than an hour, and is a worthwhile visit for the $4 admission price. They also give you a guide with a map to the historic homes and buildings in the area. The guide lets you do your own walking tour! After taking our spin around the historical society museum, we poked around in some of the shops and art galleries on the main drag. Jon got to visit a record store, and I went to the coffee shop across the street to get sandwiches to take on our return ferry trip. And last but not least, we stopped in a little wine shop, The Wine Seller, to see if we could find a local bottle of wine to take home. By that point, I was really hungry, so I wasn’t thinking straight, and was a bit overwhelmed by the huge selection of wines. If we had a little more time (and something in my stomach), I would have made good use of the great selection in this wine shop! As it was, we picked out a bottle of Christina James Pinot Noir to take home with us and try (more on that in an upcoming post). 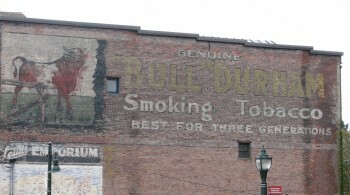 My Favorite Mural in Port Townsend – Not that I go for smoking advertising, but this is very cool! As we were waiting in line for the ferry, the sky had cleared to sun, and we had a wonderful return trip on the ferry. When we got back to Coupeville, the sun was getting lower in the sky, but Jon agreed to take me up to the Fort Casey Admiralty Head Lighthouse so I could get some last pictures of the day. I have memories of a great day, and I leave you with these. After work on Friday, January 11, I had the opportunity to attend an exhibition opening at the Whatcom Museum. 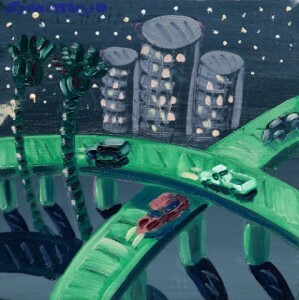 Cheech Marin, of Cheech and Chong fame, has amassed a collection of small paintings by Chicano and Chicana artists, and he has loaned the collection to museums around the United States. The exhibit is here at our museum through March 24, 2013. The event was a museum members’ and their guests only event, and Cheech Marin was there in person to introduce the exhibit and give a little context. I went with a coworker, and there were a couple of other coworkers there, so at the beginning we did some chatting, had a glass of wine and enjoyed the Mexican appetizers that were provided. The food was catered by Jalapenos restaurant in town, and they always do a great job. Sadly though, when we went through the line, there was no more guacamole! I had to settle for only sour cream – but that’s hardly worth mentioning. After a little while, Cheech arrived and spent some time mingling with some of the evening’s guests. It was kind of funny to watch him get pinned down by one person or another. Eventually the staff had to extract him so he could go upstairs and introduce the exhibit – otherwise I think people would have talked his ear off all night! The exhibit was upstairs in the Whatcom Museum’s smaller exhibit gallery, and Cheech spent a bit of time discussing the collection and how he came to own the various artworks. He emphasized that the collection was created not by Mexican artists, rather Chicano and Chicana artists who are Americans. While some of them were born in Mexico, they all now live in the United States. And all the paintings are small – the dimensions for the collection did not exceed 16 x 16 inches. I don’t remember everything he told us, but he is clearly proud of the art that is emerging from this group of artists. He collects both established and emerging artists, and one of the things that was interesting for me was not knowing who was who. 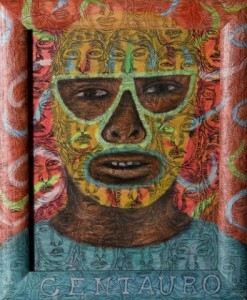 The paintings generally explore the cultural lives of the artists; examples include four exquisitely done still lifes of common foods eaten in Mexico, such as stomach and tripe, and a series that show men wearing masks worn by the Lucha Libre professional wrestlers that are very much a part of the culture in Mexico. I have to say, the subject matter of an animal’s stomach is a bit disconcerting, but the painting was excellent – very realistic! Cheech told us that his hope is that the exhibit will help people embrace the cultural shifts that our country has experienced over time by introducing people to the Chicano art movement. My coworker and I enjoyed moving through the galleries and looking at each work. 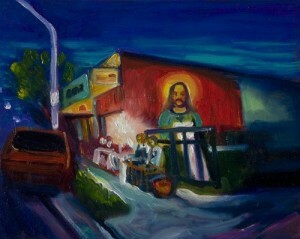 Chicano art includes some bright vibrant colors and eye catching scenes. I certainly liked some more than others, but they all were very interesting. I really enjoyed myself, and got the chance to see some artwork that opened my eyes to some emerging styles. And last but not least, my favorite painting of the collection was by Ana Teresa Fernandez. Her paintings provide a social commentary in pictures, showing women dressed up to be very sexual and provocative, completing day to day domestic chores. Her work exudes the sexuality that she intends the viewer to feel, and it makes you think about the roles women are expected to fill. Her work is so real you have trouble believing it is a painting and not a photograph. I would love to see more! So, if you have a chance, check this exhibit out. As an added bonus, the Whatcom Museum is also showing Impressionist Paintings by California artists. That exhibit is certainly worth the time. The last few days have been sunny! And very cold. I haven’t been to the Arboretum in a couple of months because… well there are a variety of reasons. 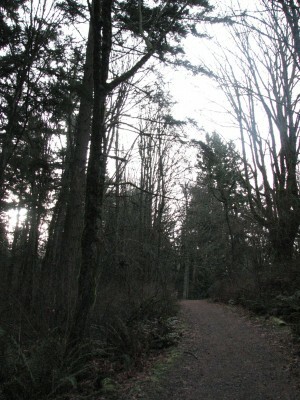 It is dark before work and dark after work, and the Arboretum is too wooded to be out in when it’s dark. And it’s wooded enough to be quite muddy at certain times of the year. And everybody knows that the Northwest gets a lot of rain in the late fall and winter. But with yesterday being sunny and cold (and the weekend), I decided to venture out for a hike in the woods. I also decided to take my camera and get some winter photos that I could compare to April – see my post from last spring. And since it has been so cold, I figured the ground would be frozen solid, and I wouldn’t have to worry about mud. The hike in was just as steep as it always is, starting me off winded and sweating enough to take of my extra layers. But then at the top, it levels out – requiring me to put most of my layers back on! 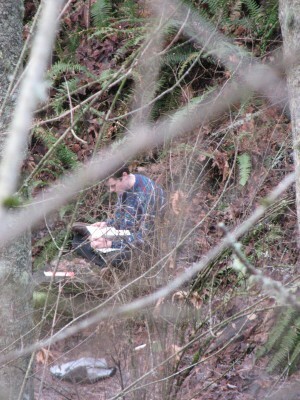 I did my best spy impression and took a zoomed in photo of an insane college student who decided to do some reading in the woods. Without a coat! You obviously can’t tell in this photo, but it never made it above freezing yesterday! He was out reading in 30 degree weather – this would send my father into convulsions. This Crazy Student Was Reading in the Arboretum – It Was 31 Degrees! And No Coat! Unfortunately, the batteries in my camera died before I got many more photos, but it was a great hike. 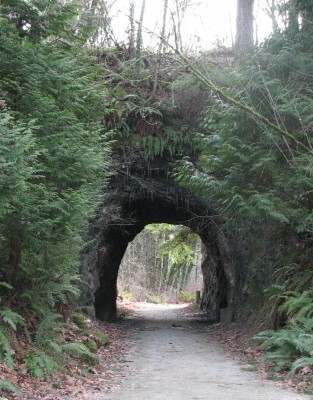 I visited the sandstone tunnel, which was carved by hand in the 1920s. 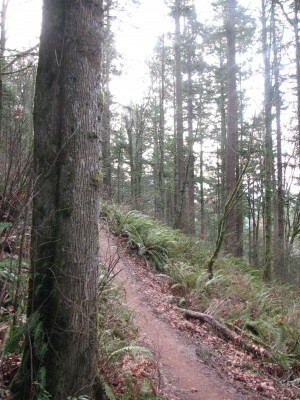 And I got a great workout with these trails! 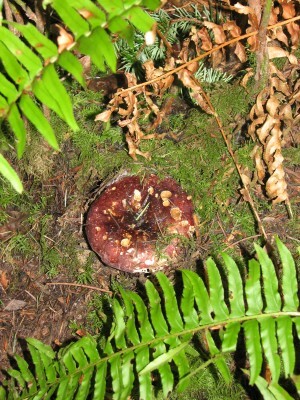 And my last photo was of this neat mushroom – about 5 inches in diameter. And when I got home, I really needed to warm up! I was chilled to the bone!